At 10:30 am on September 4th, XXIII Sunday in Ordinary Time, the Holy Father Francis celebrated in Saint Peter’s Basilica Holy Mass with Rite of Canonization of Blessed Teresa of Calcutta (1910-1997, nee Gonxha Agnes Bojaxhiu), Religious foundress of the Congregation of the Missionaries of Charity and the Missionaries of Charity. We heard in the Gospel, “Large crowds were traveling with Jesus” (Lk 14:25). Today, this “large crowd” is seen in the great number of volunteers who have come together for the Jubilee of Mercy. You are that crowd who follows the Master and who makes visible his concrete love for each person. I repeat to you the words of the Apostle Paul: “I have indeed received much joy and comfort from your love, because the hearts of the saints have been refreshed through you” (Philem 1:7). How many hearts have been comforted by volunteers! How many hands they have held; how many tears they have wiped away; how much love has been poured out in hidden, humble and selfless service! This praiseworthy service gives voice to the faith it gives voice to the faith! and expresses the mercy of the Father, who draws near to those in need. Following Jesus is a serious task, and, at the same time, one filled with joy; it takes a certain daring and courage to recognize the divine Master in the poorest of the poor and those who are cast aside, and to give oneself in their service. In order to do so, volunteers, who out of love of Jesus serve the poor and the needy, do not expect any thanks or recompense; rather they renounce all this because they have discovered true love. And each one of us can say: “Just as the Lord has come to meet me and has stooped down to my level in my hour of need, so too do I go to meet him, bending low before those who have lost faith or who live as though God did not exist, before young people without values or ideals, before families in crisis, before the ill and the imprisoned, before refugees and immigrants, before the weak and defenseless in body and spirit, before abandoned children, before the elderly who are on their own. Wherever someone is reaching out, asking for a helping hand in order to get up, this is where our presence and the presence of the Church which sustains and offers hope must be”. And I do this, keeping alive the memory of those times when the Lord’s hand reached out to me when I was in need. Mother Teresa, in all aspects of her life, was a generous dispenser of divine mercy, making herself available for everyone through her welcome and defense of human life, those unborn and those abandoned and discarded. She was committed to defending life, ceaselessly proclaiming that “the unborn are the weakest, the smallest, the most vulnerable”. She bowed down before those who were spent, left to die on the side of the road, seeing in them their God-given dignity; she made her voice heard before the powers of this world, so that they might recognize their guilt for the crime the crimes! of poverty they created. 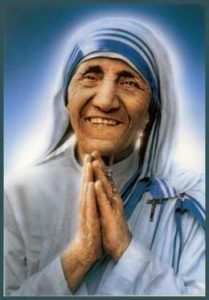 For Mother Teresa, mercy was the “salt” which gave flavor to her work, it was the “light” which shone in the darkness of the many who no longer had tears to shed for their poverty and suffering.